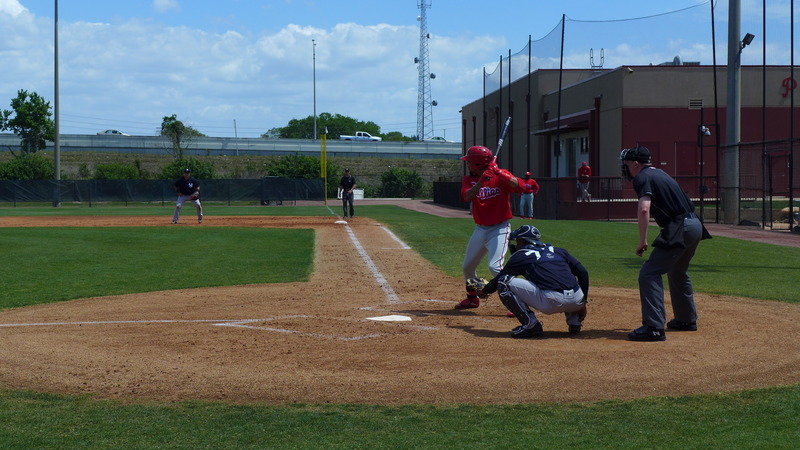 The Yankees visited the Carpenter Complex, and AAA and AA games were played on the two worst fields for fan viewing. 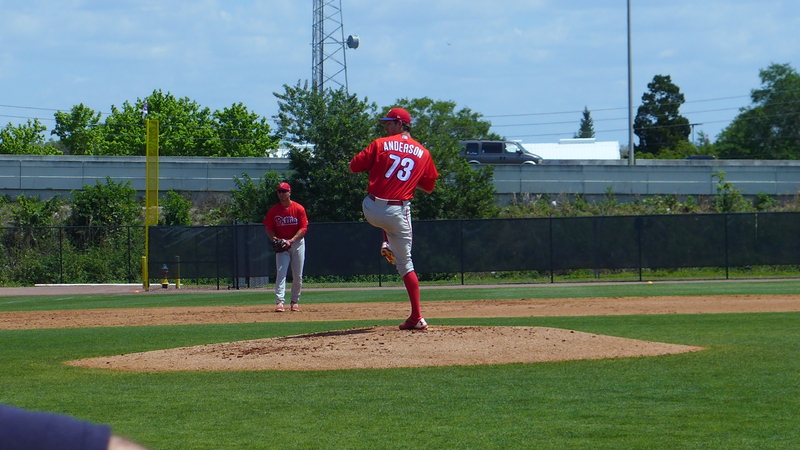 Zach Eflin pitched in the AAA game and Elniery Garcia started for the AA squad.Eflin pitched 4.0 innings. He gave up a run on 3 hits and a walk. He struck out two. His fastball was around 93-94 mph. 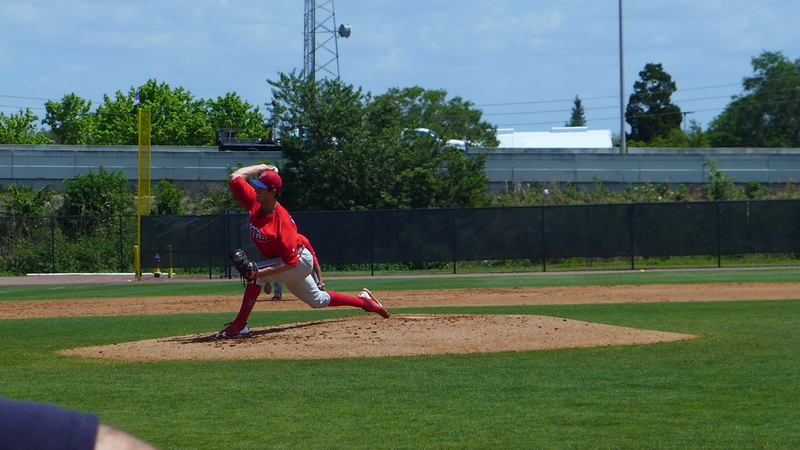 Here’s some video from his first inning. After the single, a Yankee batter tried to bunt. With a charging fielder yelling “One! One! One!”. Jorge Alfaro scooped up the ball, ignored the direction to throw to first, and gunned out the lead runner at second base. Carlos Tocci made a running catch against the center field wall to save Eflin some damage. Rhys Hoskins hit a home run to left field. Osmel Aguila made a diving catch in center field and hit a home run to left field. Williams and Cameron Perkins hit line drive singles to right center field. J.P Crawford struck out a couple times. Elniery Garcia started in the AA game. He allowed a base runner before retiring him on a double play and recording a strike out. This was his first appearance since reporting from major league camp, and he only pitched the one inning. Drew Anderson followed and the only video that turned out was this one where he gave up a double. The short-season kids didn’t have a game and ran through some drills on Ashburn and Carlton Fields. 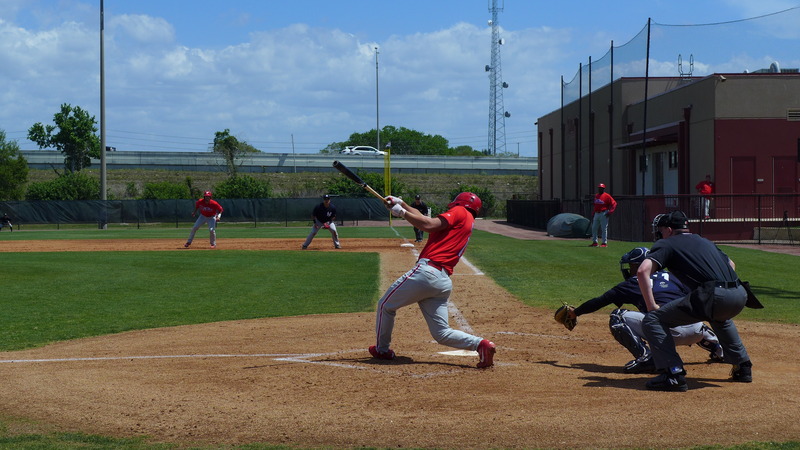 Mickey Moniak didn’t take the bus ride to Tampa and took fly balls on Ashburn. Afterward he watched the AAA game with Josh Stephen. Before the game, we learned that three of the recent minor league releases were Will Moriss, Christian Marrero, and Ulises Joaquin(!?!). A couple players were wearing Marrero’s jersey on the field during warm ups. During the game, word filtered down that the Phillies had released catchers Ryan Hanigan and Bryan Holiday. Roman Quinn was optioned to Lehigh and Michael Mariot was reassigned to the minor league camp. Ulises Joakuin was released? He’s a smallish righthanded reliever. He failed at AA last year but had a solid year in A+. He will be 25 in June. I guess the Phils have a lot of guys who can replace him. They probably think A+ is where he’ll top out and it’s time to move on. There might have been another factor. I thought he looked much heavier than I remember from last year. In fact the first time I saw him leaving the Complex with other pitchers back in early February, I thought his physique reminded me of Willians Astudillo – short and stocky. If there really was significant weight gain, it may have affected his pitching, and/or led the Phillies to question his commitment to good health and baseball. Prior to looking at the videos above of Eflin, I really thought the Phillies would place him on the 60-day DL starting next week, one, to ensure he is completely healthy and two, which would open a 40 spot for another player, at least thru 31 May. Now I am not sure what the Phillies will do. That was what we discussed while watching Eflin. Sometimes the audio gets onto the video. You may have heard me utter the same sentiment. If Eflin can pitch four innings, AND if Garcia is returning to his throwing regimen, then maybe neither is a candidate for the 60. I guess we will know what they decide to do next week. The issue with the 60-day DL…you are on it for the whole time…no early returns from what I read somewhere ….whereas on the new 10-day DL, which was initiated with the latest CBA, you can come off it any time or be transferred to the 60-day. Not sure if that is correct however. 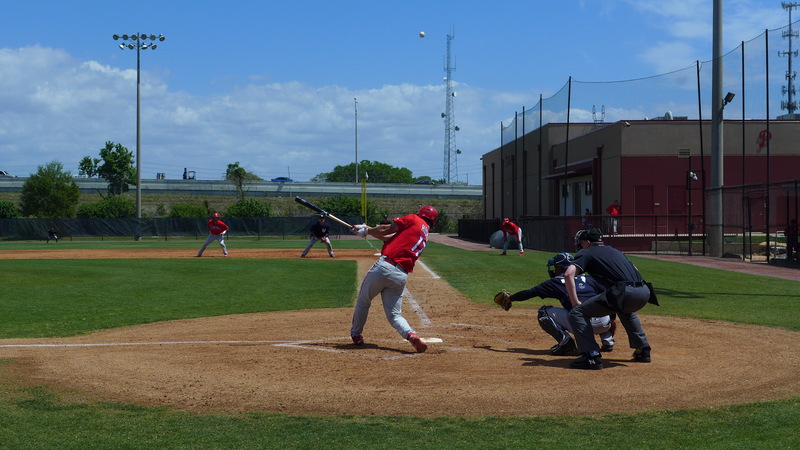 Carlos Tocci made a running catch against the centerfield wall. Wow! We’ve so concentrated on Quinn, Williams, Cozens, Altherr, Pullin and Co. that Toccci seems almost like a name out of the distant past, yet he’s still a youngster working his way up. Thanks for the game report, Jim. Nice to read and see Eflin appearing healthy and effective. Video of 3/27/17 ; Anderson, Pinto, Perkins and Crawford.